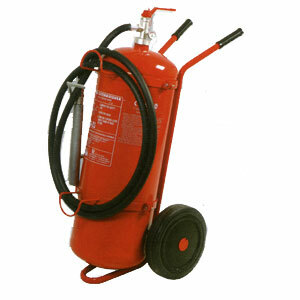 Wheeled 100 litre AFFF foam fire extinguishers are suitable for protecting large industrial risks and are built to exacting standards, with all models mounted on a strong steel chassis and featuring solid rubber tyres. These stored pressure extinguishers offer reliability when tackling large fire risks. Wheeled 100 litre AFFF foam fire extinguishers are designed for use in industrial premises, fuel stores and building sites. Foam extinguishers are suitable for all Class A (wood, paper & cloth), Class B (flammable liquids) but are not suitable for use on electrical fires.